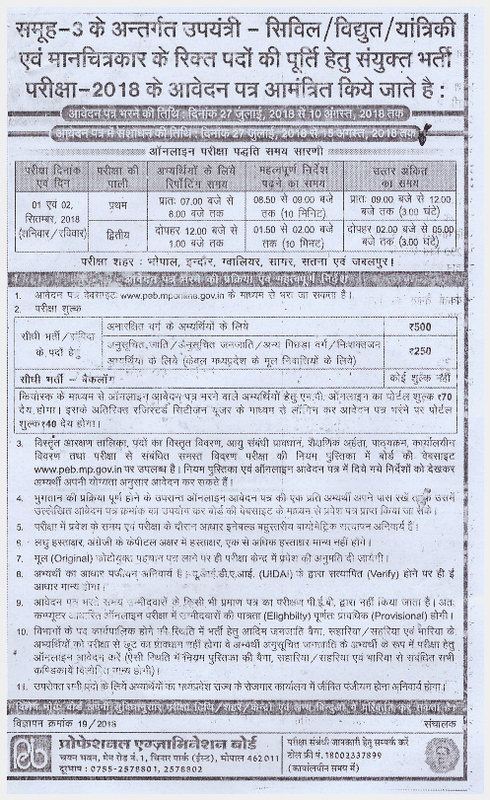 Madhya Pradesh Professional Exam Board MPPEB Vyapam has announced Online Application Form for the Recruitment Post of Sub Engineer Vacancy 2018, Candidates who are Interested in the MPPEB Vyapam Sub Engineer Online Form 2018, (MPPEB Sub Engineer Online Form 2018) and Completed the All Eligibility Criteria also Read the Full Notification before Apply Online. The last date to apply online 10/08/2018. MPPEB Vyapam Sub Engineer Result 2019 announced. Bhopal, Indore, Gwalior, Sagar, Satna, and Jabalpur Only.